Today I am privileged to feature a guest blog post by radio personality Gloria Plaisted. She is the founder of Faith@Work Break, a 60-second radio broadcast based out of Duluth, Minnesota. Feel free to stop by and “like” her Facebook Fan page at Faith@Work Break with Gloria Plaisted. Gloria’s story is featured in BlessBack®: Thank Those Who Shaped Your Life and is a favorite among readers. Gloria’s story begins at chapter five. If you haven’t read the story, I urge you to download a copy of BlessBack at Amazon for $2.99 to your Kindle or download it to your Kindle Reader to read on your computer. 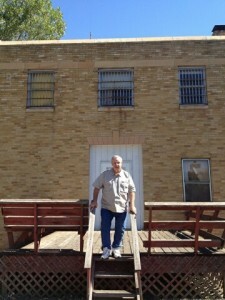 People have often asked me if Gloria and her husband Rick ever reconnected face-to-face with Sheriff Kenneth Wherry in Faulkton, South Dakota and I’m happy to say, they did in September 2012. 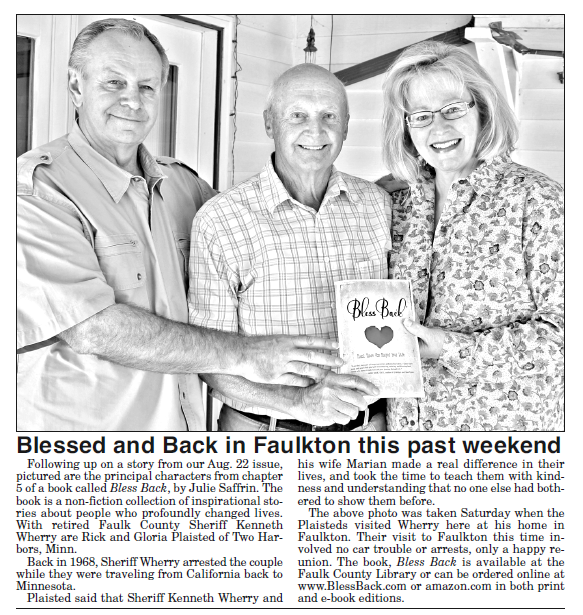 Their story was chronicled recently in the Faulk County Record newspaper. 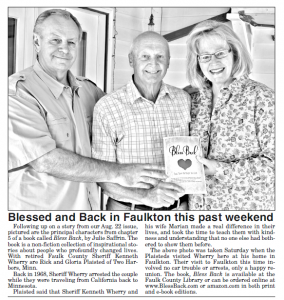 Below, Gloria has written a lovely story of her and her husband’s visit to Faulkton, South Dakota, to reconnect with a man and a town that changed their lives. 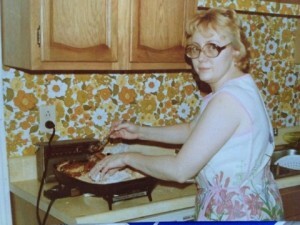 This is another story from Gloria’s life that tugs at the heart. If ever you have wondered if giving thanks to those people who have made an indelible impression on you – whether doing so really matters – Gloria and Rick Plaisted’s BlessBack to Sheriff Ken Wherry surely will convince you to do so. I believe we have a choice in life between grudgery or gratitude. Live with grudgery and more than likely your bones will rot. Choose a life of gratitude and brace yourself as whole new chapters start opening in your world.
. . . to get up and reach out and seize those moments that would bless others. I believe God honors gratitude. In Ephesians 3:20, God tells us that He is able to do exceedingly, abundantly above all that we could ever ask or think. That promise is true. It was never truer than in September of 2012.
. . . and demonstrated for the first time in our lives … God’s love. We took in the view while incarcerated. It was very different than our life. It was a view of a kinder world and of two people who exemplified the true American family way of life. Yep, it was like coming home to Mayberry USA, complete with Sheriff Andy. Have you ever watched a movie to the end, only to wish you could know what happened beyond the ending?
. . . Or better yet, create the sequel yourself? 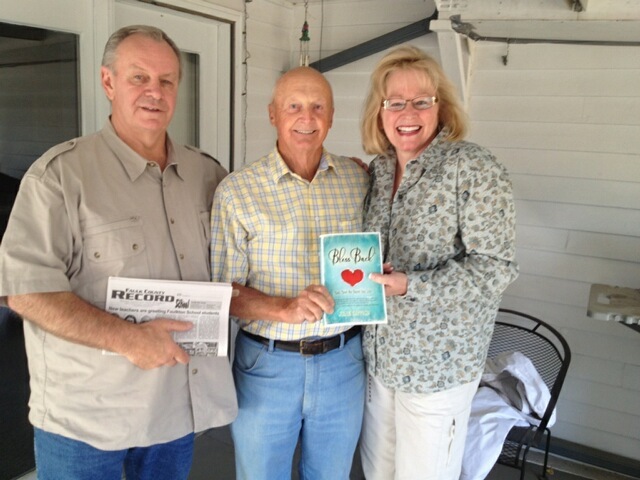 In Chapter Five, page 58 of Julie’s book BlessBack; you can read our amazing story. I’m certain it will bless you. If you have already read it, I want to share with you the rest of the story. 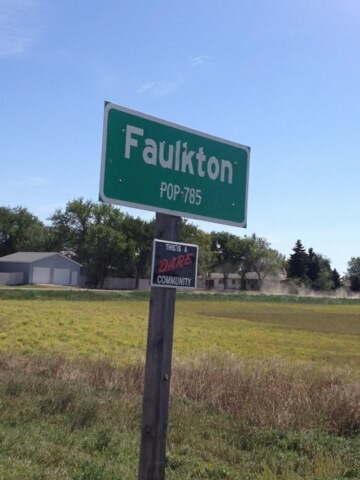 This past September, amidst the endless sunflower fields in South Dakota, we drove (legally, this time) into the town of Faulkton, South Dakota, population 785 … for the second time. Forty-four years later, it appeared as though nothing had changed. It was if the movie set of our story remained untouched, waiting for the sequel to finally take place. For those who haven’t read my account in BlessBack, here’s a little backstory. 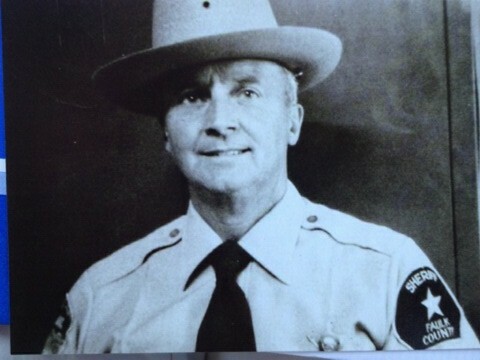 In November 2007, after having wanted to thank Sheriff Wherry and his wife Marion for their kindness to me forty years ago, I pulled off on the shoulder of a highway, picked up my cell phone and called the Wherrys. I couldn’t procrastinate a minute longer. When Ken answered the phone, I just started thanking him. I couldn’t stop. My heart was overflowing. Marion was in the kitchen the day I called and overheard our conversation. We exchanged letters and Ken even dug up a picture of Rick and me from back then and sent it to us. Our so-called mug shots caused us to laugh. Of course we hadn’t laughed the day we had our fingers stamped and our picture taken. Back then, we were a pair of scared, scruffy-looking teenagers. I stared at the picture wondering if that moment in time was a dream or did the story really go down. Sadly, Marion had passed away months after Kenneth received my phone call. Fast forward to September 2012. As Rick and I walked up the driveway of Sheriff Wherry’s house, Ken greeted us with tears in his eyes. I thought it funny that beside him was this huge lemon tree on a makeshift cart, used to wheel the plant in and out of the garage. Ken was still a young man, well preserved and in good health and I couldn’t help but wish Marion could have been there. The three of us embraced each other as if it were a long awaited homecoming of family. Neither of us could hold back the tears and we didn’t even try. “Do you remember the lemon tree Marion started in a styrofoam cup in the jailhouse when you were my guests?” I looked at the tree and realized it was the lemon tree, now six feet tall. I think it was his way of having Marion present with us. He graciously shared his home and proudly displayed the countless artifacts collected through the years from his love of metal detecting. From there we dined at the 212 Café where we were arrested 44 years ago. This time we bought the sheriff lunch. 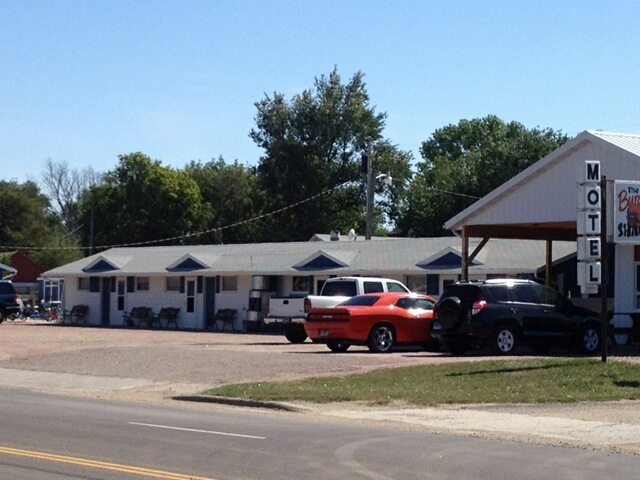 On our way, we passed the motel we hid out in that scary night long ago. 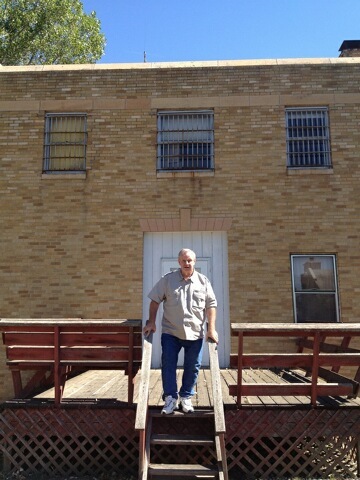 And the jailhouse where Rick and I were cellmates was amazingly still standing.
. . . as the day we stood before our very own real-life hero. God granted us the time to reunite with the very people he dispatched in our young lives to help us begin building a foundation. Sheriff Ken Wherry took a chance on two lost kids. Ken is part of our family now, and we hope to have him as a guest in our home someday. I can’t explain it, but we love this man as if he were our father. It’s been said that you can never go home again and relive moments in time as they were … maybe not, but if you decide to choose gratitude and to BlessBack those who entered into your life and made a positive impression, you too can revisit the moment.